Modern criminals use all types of portable cutting equipment to gain entry to warehouses, distribution centres, garages, factories, maintenance buildings, storage facilities etc. Professional criminal gangs can enter and escape, with the contents of a building within four minutes . . . Constructed from pre galvanized steel and designed to provide a hollow section panel with CFC and HCFC free thermal infill. Each panel section is 100mm deep with twin-ribbed face for rigidity. Each alternative panel includes advanced bonded composite anti cut bars over the bottom 1.8 metres with added side load fittings. The curtain when assembled is held in position with purposely designed injection moulded end fittings manufactured from hard wearing nylon-6. The bottom panel of the shutter is terminated with a purpose designed steel section complete with interlocking (EPDM) rubber weather seal. Manufactured from mild steel tube to BS4750 Grade 50C and designed to suit door width and height. Maximum barrel deflection is 1:400 and is fitted with precision-machined BDMS axles to BS970 EN33 blocks. Barrel is sealed with a coat of protective paint. Guides are formed from pre galvanized steel with a minimum thickness of 2.5mm incorporating twin vertical brushes on both inner and outer face of the guide. Brush carrier is constructed from PVC of medium impact strength, finished black and incorporating twin siliconised polypropylene weather strips running full height of the shutter. The main support brackets for the barrel and motor unit are manufactured from mild steel plates of varying thickness to suit the door weight and incorporate the necessary fixing positions for securing back to the opening structure. The door is arranged for an electric motor unit with manual hand hoisting and lowering facility. The motor unit is complete with an in-built safety drive system. Operating voltage is 400V 3-Phase IP54 protection with 60% duty cycle maintenance free and TUV-Tested, complying with all current European Safety Standards. The Secureflex roller shutter has a weighted sound reduction value of 18dB (BS 5821 Part 3: 1984). 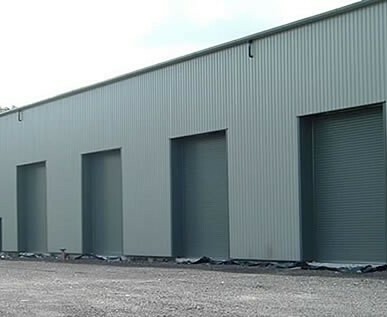 If you require more information about our insulated Secureflex roller shutters in Essex and London, please call us today on 0845 644 1225.